Waterbox has been working very closely with the Aqua Illumination team on this new partnership collaboration and now happy to announce these bundles will be available, Due to strict MAP pricing policies no discounts will apply on this product. Create the Ultimate and Complete Aquatic Environment with our + Model Aquarium Bundles. No longer are you limited to using a fixed amount of power per channel, the HD dynamically adjusts power available to each color, borrowing power from the colors you’re not utilizing. Giving you the most vivid spectrum your tank has ever seen. Great for mounting multiple lights on one rail across your tank. Requires a mounting rail to fit your tank, and brackets for each Hydra. Building on AquaIllumination®’s rich heritage of building world-class LEDs, the AI Hydra HD Series brings a new level of performance. At a maximum of 95 watts from the wall, it follows in the family’s efficient footsteps. The AI Hydra TwentySix™ HD utilizes the latest LED technology from leading manufacturers, arranged to provide the best performance. Starphire  Ultra-Clear™ glass with the highest quality silicone and crisp edges. No sloppy corner silicone here. Each aquarium is water tested, polished and inspected before it is brought to market. All Waterbox Platinum systems feature dual return’s which will help to prevent dead areas within your aquarium. Flow is one of the most important aspects to keep your aquarium healthy and pristine. Dual entry doors allows access to equipment and sump under the tank from both sides of the aquarium. Our elegantly crafted cabinetry boasts a dedicated compartment to store the Waterbox sump system that is proprietary to each model and series. Stainless marine spec hinges keep your cabinet rust free there for increasing the longevity of your furniture. European doors that are flush with the front glass aquarium panel provide ease of access into the cabinet. Each Crystal Series features a dual manifold pre-plumbed into the system which can be used to add popular reactors to your aquarium without the need for extra pumps and tubes. 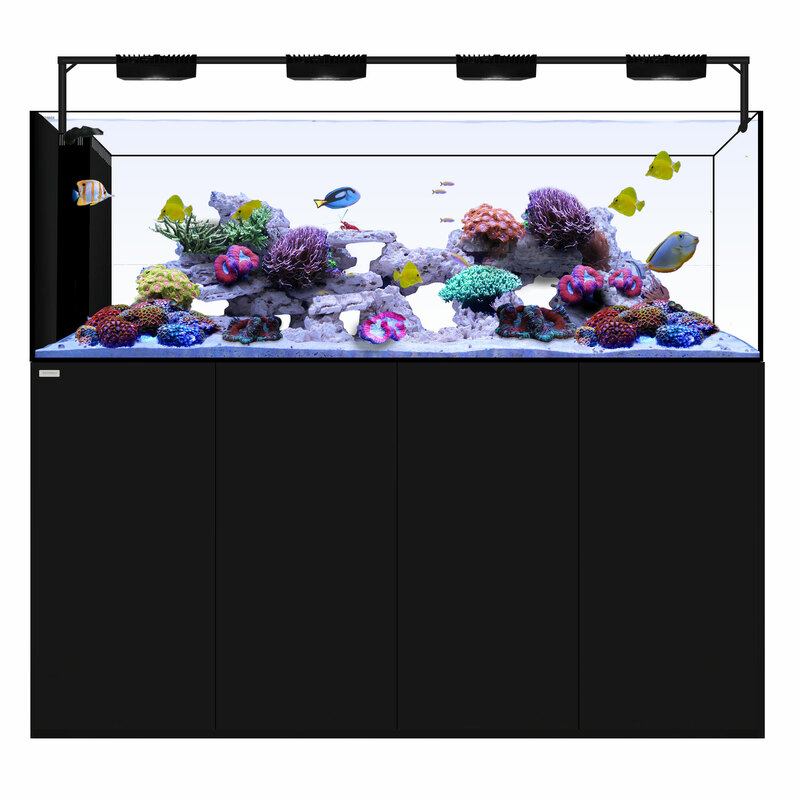 Removable divider wall allows users to build in a refugium into their aquarium or divide their sump for alternate uses. Our Crystal Series tanks boast 4 x 4″ filter socks to keep your water quality pristine at all times. Each Crystal Series aquarium includes a Evaporation Reservoir built into the sump and our large 6′ tank includes a 15.9 Gallon additional reservoir for auto top off water.